The harvest festival of Sohrai is the biggest and most important festival of the Santals. 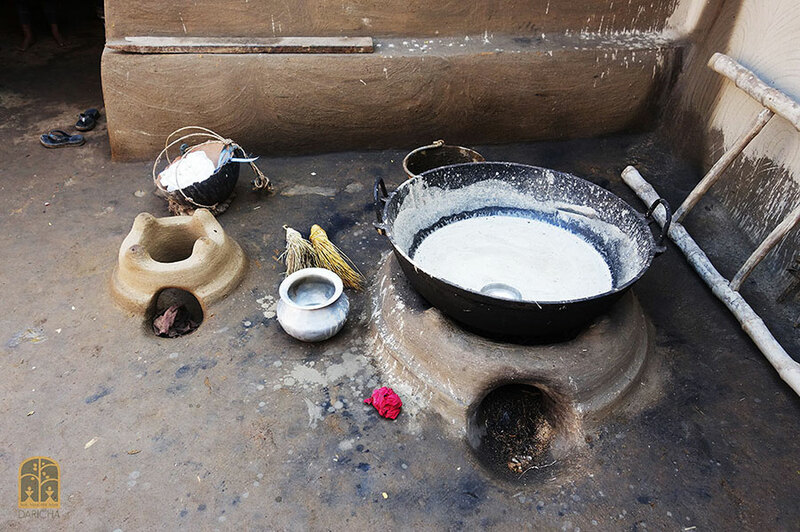 During this festival, Santals pay homage to their gods and their ancestors as a thanksgiving for their crops, their cattle, their ploughs and everything that has helped them attain this harvest. They believe that Marang Buru, the God of the great mountain had blessed their people with cattle for agriculture and their livelihood. Sohrai is mainly celebrated at the beginning of the winter harvest, when the paddy has ripened, on the new moon day (amabashya) of the Bengali month of Kartik (mid October to mid November), coinciding with Kali Puja. In some regions, celebrations take place at the end of the winter harvest in mid January (the end of the Bengali month of Poush), after they have reaped and threshed their paddy. Santal elders believe that originally, the festival was celebrated in October, but was deferred to January perhaps a hundred years ago or so, because, for the poorer villages, it was economically more viable to celebrate after gathering the fruits of a harvest. The festival is also celebrated as Bandna by ethnic groups such as the Kurmis and Got Puja by tribes such as the Mundas and Koras. Irrespective of tribe or community or when it is celebrated, the festival is a thanksgiving and chiefly reflects each community’s respect and gratitude for their cattle and livestock, which have been indispensable to their agrarian way of life. Sohrai is generally a five day festival by Santals, though in some areas, it is shortened to three. The date of the festival is usually decided by the Manjhi (village headman) of a village in consultation with his people. 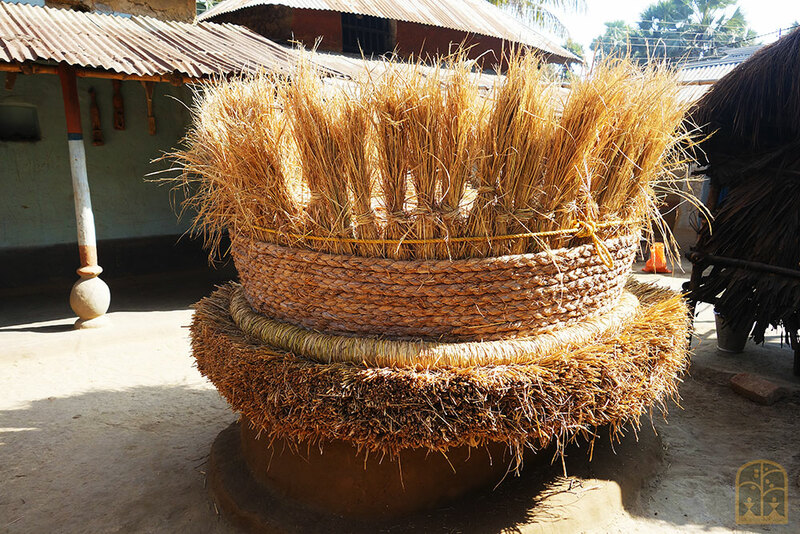 There is no fixed date marked off, thus celebrations are often staggered across villages (within the traditional time frame) - the purpose being to enable villagers to celebrate Sohrai in their own villages as well as in those of their relatives. Once a date is decided upon, people start inviting their relatives, especially married daughters and sisters, and simultaneously start preparing rice beer or handia, a key component of the celebrations. 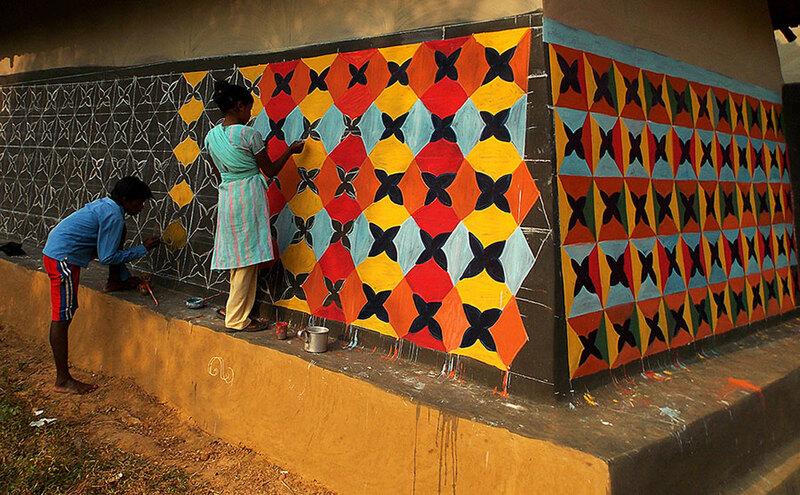 In preparation of the festival, the women of the community repair their mud walls and floors and decorate the walls with their stunning traditional art. Depending on the complexity of the designs, the women start work either a few days before the festival or even as early as a month before. 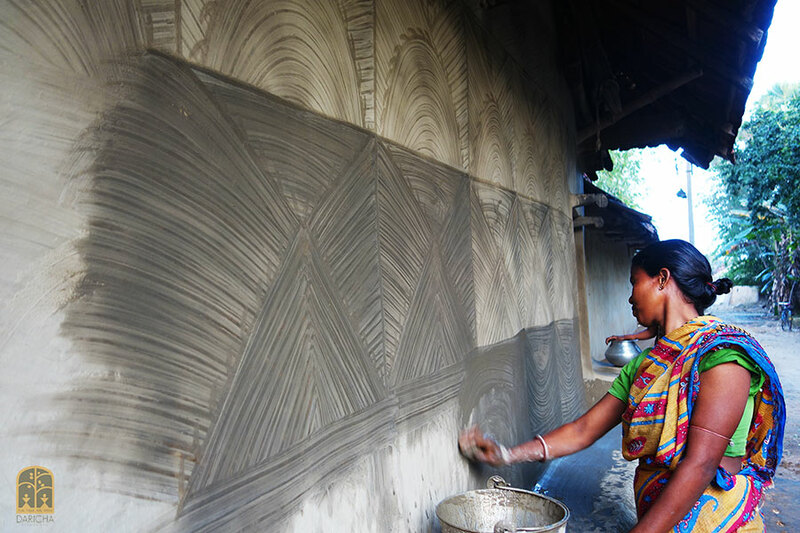 Traditionally, Santal women would decorate their walls with relief work, but this has been, in the main, replaced by "finger painting". The decoration has to be completed by the eve of the festival. 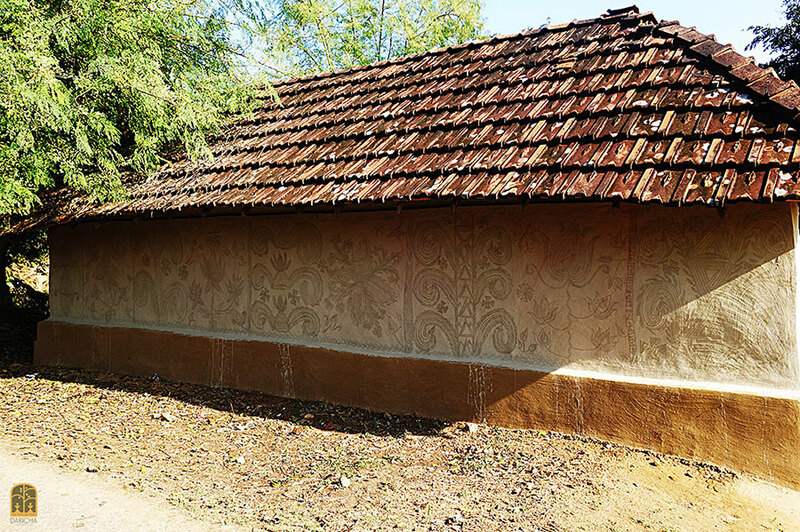 The distinctive Sohrai art painted on the mud walls is a matriarchal tradition handed down from mother to daughter. Dwellings in entire villages are elaborately painted by the women using twigs or their palms or fingers. The paintings may be monochromatic or extremely colourful. Traditionally, the colours used are all natural. Every available space is filled with some form or the other.  The plinth is usually painted jet black, usually with a solution of ash from burnt straw or cycle tyres and water. The clay is brought from nearby areas and is usually a brown and a white variety. In some regions, use of yellow and reddish clay (usually brought in from Jharkhand) is also seen. Once the wall is repaired, it is plastered over and smoothened with several coats of brown clay sifted and mixed with cow dung and water. 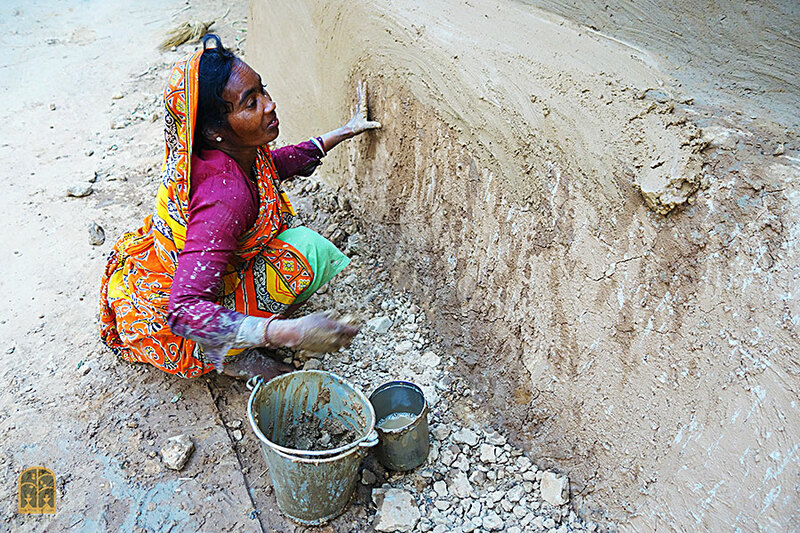 Over this is applied a thin coat of diluted white clay (khori mati) in a sweeping motion - which typifies the walls of a Santal home. 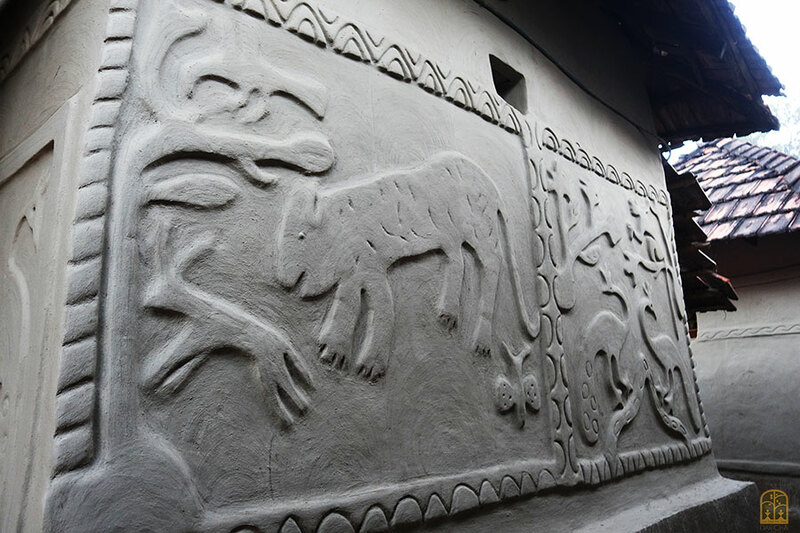 Intricate patterns are then quickly traced over the white clay before it dries, revealing the brown undercoat. The motifs are regular arches, geometric patterns, fertility motifs and various flora and fauna. Once dry, the designs stand out in monochromatic splendour. 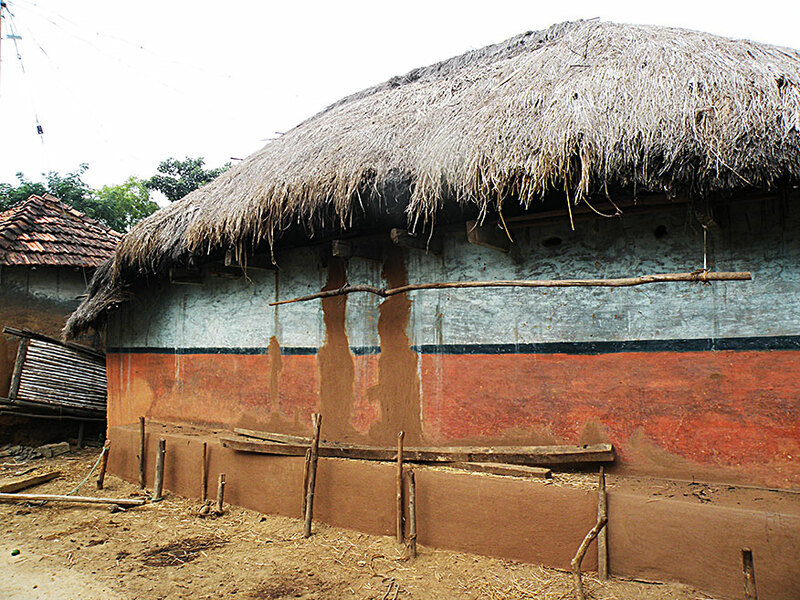 Many indigenous communities of West Bengal too paint the walls of their dwellings during Sohrai. But the painted murals are disappearing with the onset of urbanization: old forms of their animist culture are dying out and are increasingly being replaced by Hindu gods and goddesses and objects from school drawing books. Among the Santals in West Bengal too, traditional motifs and styles have given way to mainly floral patterns. And a Hindu god or two have made their appearance in either bas relief or painting on a few walls. In homes where traditional bas relief ornamentation continues, a recent trend is embedding small pieces of mirror as a design element. Another trend in some areas is the use of not only chemical dyes but also stencilled patterns to create dramatic but decidedly non-tribal wall art. The tribals themselves rue the fact that the art is being forgotten, especially in the vicinity of the more developed regions of West Bengal. In some Santal villages, particularly in Birbhum, the Anthropological Survey of India has started taking a few steps in re-familiarizing these people with their traditions. Proximity to mainstream society, absence of open land from where they would have got the mud and general poverty are the key culprits. Many tribal women have eschewed their traditions in favour of more economically viable occupations - daily labour or supari cutting or beedi making. Education too is taking its toll on these traditions: young women find it difficult to devote time to these practices, burdened as they are with school or college studies and tuitions. In recent times, young men and boys too are seen to be helping in the wall painting. The five days of the festival is accompanied by a variety of rituals, consumption of handia in copious quantities, dancing, singing and merry making. On the first day, rituals and sacrifice of hens are conducted by the village priest (Naike) in an open space as an invocation to their gods (bongas). It is attended by only the men of the village. After a feast of rice boiled with the chicken, the village headman (Manjhi) announces the start of the festival. The second day is devoted to invoking blessings from the bongas in each individual home. During these two days, villagers bathe their cattle and anoint them with oil and sindoor (vermillion); they clean their cattle sheds, yokes and other agricultural implements and decorate the floor with alponas made from rice flour. On the third day, the bulls of the village are tied to posts outside each cattle shed and then follows a ritual of teasing and agitating them by waving sheets of leather or cloth in front of them. Visiting relatives are entertained on this day. All along, and through the night of all these days, groups of men dance down the village street, singing and blessing the cattle. On the fourth day, they are joined by the women. And on the final day, the Manjhi brings the festivities to a close. Different songs are sung for different days. Unlike earlier times, the songs sung on the first three days are sung by the men only and the songs that the men sing are different from those of the women. 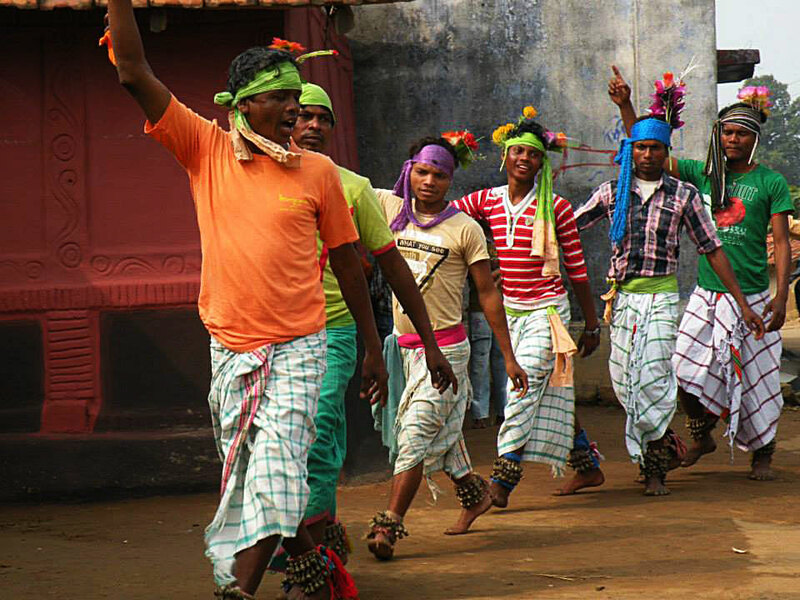 The songs and dances for this festival are a mix of Lagre and Sohrai and Jharumjha, the last of which is performed only when the dancers reach the crossing at the end of the village.